St. Peter’s Food Cupboard has provided food for local families in need since 1987. We distribute food (including meats, fresh fruits, and vegetables) by an open-choice system, feeding an average of 180 families each week. Volunteers are needed Saturday mornings and Tuesday and Thursday evenings. 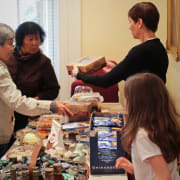 To sign up online for a volunteer shift, visit www.stpetersphila.org/foodcupboard. We believe that no one should go hungry, and we make food available at no cost. The Food Cupboard (located at 313 Pine Street) is managed by more than 100 volunteers from the church, neighborhood, and community. Individuals as well as groups from universities, youth groups, and schools are welcome. On Thursdays from 4:30-6 p.m., volunteers are needed to unpack, sort, organize, and store pallets of food we receive from Philabundance. On Saturdays, volunteers work from 7:45 a.m. till 10 a.m. They help prepare the food for our clients, and then serve food and operate the Food Cupboard. There are also volunteer opportunities for Mandarin and Cantonese interpreters.